It is not exactly Masada -- but something of a last stand all the same. OFF 9 a.m. to Eton where I mail books to India. 12.20 p.m. flight to Düsseldorf (airport is extra-territorial, so police can't touch me: in theory), change there for the flight to Budapest, R. at the airport, looking good again in her "Madrid" outfit, with "Herbie" (her son). Very nice house in the countryside by Budapest. I shall work well on Himmler here. They are very hospitable. I run (i.e., hobble or limp fast, feeling rather like Charles Laughton as The Hunchback of Notre Dame) around the garden a lot chasing Herbie, aged four, and tipping him over my head to squeals of delight and laughter, but inevitably trip and fall and R. finds my forehead bleeding. Nothing serious. Children are such fun. She has made up a bed in their sitting room for me. It is very low but comfortable. The houses around are equipped with at least two dogs each, covering the entire tonal range of Magyar woofs, yaps, yelps, and barks. But the night is dead silent. 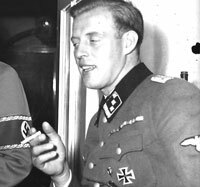 Left: Horst Wessel, murdered by Communist gangsters, became a Nazi martyr. Breakfast on the terrace. R. has donned another revealing summer dress. Little monkey. Georgie, Herbie's father, hangs around smoking heavily (in the garden and on the terrace). I tell Jaenelle in an email that we shall spend some days in Krakow after the tour of Auschwitz. She will go off shopping. "I doubt I would be much use to you in the archives, anyway." I reply: "I know you are fishing, but here goes: You are of use to me always, everywhere, at all times. You stimulate and energize and enervate and .. uh, that's 'nuff for the moment or I will run out of bait." I explain that I stayed in Krakow before, with Alan Heath, which is why I suggest it. I only have about an hour to work at the university. They have the diary of Horst Wessel, and that has original photos which I want to scan. SHE has been badly delayed on the Interstate at Indianapolis. "I was still sitting on I-465 in bumper to bumper traffic that was not moving even an inch and extended as far as the eye could see. A semi truck and four other vehicles were totally smashed up, blocking all three lanes of traffic, so everyone was being routed around it on the shoulder. To make up for lost time, I flew along. Got off my exit and I passed a cop, who pulled out behind me and followed me for several miles out of town. I was doing a reasonable 57 in a 55 zone and he was content to sit behind me. Then suddenly he turned on his lights and pulled me over for no apparent reason. First he asked me if I had been drinking. What a dumb question. Not only do I not drink, but as you know, I never drive like a drunk, either. So you're probably wondering what reason he came up with for pulling me over. I know what reply she wants: "I too would pull you over without a proper reason. Grow up. Accept the facts . . ."
My friend said he was "sure" that I only got pulled over because the cop thought I was good looking. I hadn't thought of it til he said that, but right before he pulled me over, I decided to take out my ponytail because it had come loose and was bothering me. So he probably saw this big fan of ultra long blonde hair go flying. He might be right, as there really was no logical reason for him to have pulled me over. I sigh. "Stop fishing. I put a lot of mental and literary effort into composing my last response to this episode." A cop once pulled over my wife (above), when she was very cute, and had been driving for a year without a licence already. "That was a nice bit of parallel parking Ma'am, if I may say so," he said, as a rather feeble opening gambit. Because she probably looked unmarried rather than unlicensed. Then, stupidly: "I suppose you do have a licence, don't you?" - expecting a well-what-do-YOU-think, officer in response. "Well, actually I don't," was the reply. Imagine the confusion with which that response covered our young and very impressionable flat-footed friend. My heart went out to him when she told me. She said he went bright red, started stammering, sweated profusely, apologised, said he really ought to be reporting this to somebody, but ... she'd better not do it again, etc., etc. So the moral is: If I were a cop .., I too would .. pull you over. Jonathan Burgess asks: "I believe it is true to say that you have ten 'A'-levels to your name? May I ask which subjects?" I tell him, as best as I can remember after all these years. I did fail French, I recall. I shall be in Warsaw for two weeks or more from August 29. It would be nice to have a private chat about Himmler and Reinhardt. .. Everything is slowly becoming very flat-line. Thank God for Eastern Europe and Asia -- those markets are just beginning to wake up. I have done a lot of work now in the US Holocaust Museum archives in Washington, and copied a lot of stuff -- about 2,000 pages in fact, of their films of the Moscow archives. I have also read scores of the later Nuremberg interrogations, and all the relevant CIA debriefings of Gestapo gentlemen who returned from the USSR in 1956. Meanwhile the Himmler manuscript is now up to chapter 15 and progressing slowly, as it is extruded from my ossifying brain. 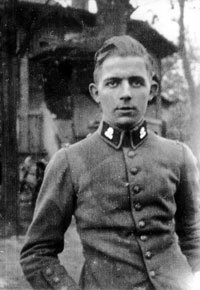 I work most of the day on Himmler, building up a dossier on the interesting Sigmund Rascher case. Did Heini ever have a thing with Nini Diehls, later Mrs. Rascher? If so, when? The other question is, how many of the Rascher documents produced by the Americans at the postwar trials were faked by them? There are strong indications in that direction. No transactions again today. No way to get rich. I HEAR Herbie having a nightmare next door -- I spend an hour challenging my memory to recall a Hungarian word for nightmare, frasznopok? -- and listening to R's attempts to pacify him. She leaves around five a.m., flying to Cyprus and back. They have brought a kitten here yesterday, and it has already clawed threads out of everything I wear. R. is keen to set up a programme of visits here to Bishop Hegedüs (who was nearly unfrocked because of hosting me some years ago), her aunt, father and others. I just want to sit and write. Georgie wanders around the house and garden all day long, chain-smoking and talking on his cellphone. She is rather fatalistic about it, I suspect. Better that than no man at all. He is now engaged in buying and selling antiques on eBay, old biscuit tins and things. "Like a Jew," I said yesterday evening when he produced his latest acquisition. THIS morning their new kitten has vanished somewhere; I suspect the monster dog next door got at it. I have learned to say ghastly dog to it in Hungarian. There is a thick fence between us. But an hour later I hear a faint mew from across the road in a garden a hundred yards away, and the kitten is retrieved with difficulty. I have dug into the Goebbels chapters, and am astonished at the eight years of work I put into that book: all for -- almost -- nothing! Lipstadt's gang got the book scrubbed by St Martins Press in the USA just before publication in April 1996, without having even read it! Being banned from Germany since 1993 does not help of course, though it does oblige me to use more eclectic sources for Himmler, like scouring the auction houses for stolen Himmler papers. R. HAS probably returned from Beirut during the night; she left here about eight p.m. last night. Do you remember the Walther PP supposedly owned by Hitler that you displayed, tongue in cheek? Well, I have read that although it is a genuine Walther pistol, it could not possibly have been a gift to the Fuehrer, as it was produced in Ulm, and not the wartime factory of Zehla Mehlis. The serial numbers are on record at the Walther factory. Production at Ulm commenced in 1965! Also I learnt that it was commissioned by one Colonel James Atwood, working for the CIA in Berlin in 1965. Apparently Atwood sold it to a Canadian collector who, when he learnt of the deception, had a portion of the slide re engraved to show earlier markings, however he could not, of course change the serial numbers or put on proper Third Reich proof marks. A pretty pistol, but , alas, completely bogus. Ah, the wonders of the Internet: That's where we find the real expert nowadays, people with no academic axes to grind. 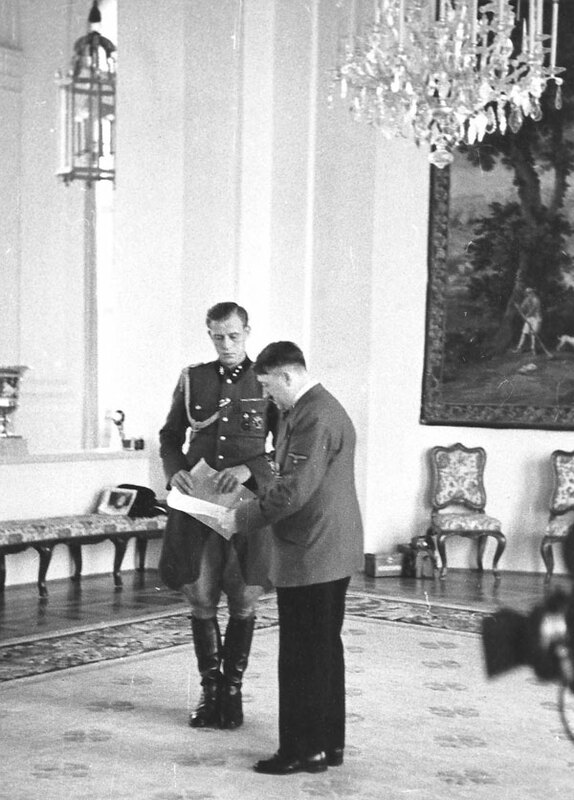 I reply: "Otto Günsche [right, SS major, Hitler's bodyguard and adjutant] told me [in March 1967] that he picked up the death pistol off the floor, unloaded it and gave it to Artur Axmann, who kept it and hid it as a souvenir." Whether he was able to retrieve it after his Soviet captivity, I do not know. Robert says: "Well David, you are the only person on Earth able to give me that answer!" "Yes, poor Günsche had a rather unpleasant death." (In an overheated sauna, not found for several weeks). THE cat pounces and prances around all night, so I do not get much sleep. R. is up already, very smart, and about to leave for her Madrid flight; she returns six p.m. or so. The cat thinks its job in life is to sit on the nape of my neck all day while I write, occasionally licking me with a rasping tongue. I wouldn't hire even a woman to do that. Once again there is an invitation from [an Irish university] to address them. I always say yes but: It never comes to anything. I have no expenses here in Budapest, which is handy as there seems to be very little income! I am hoping the Indians will do a deal on two books within the next seven days and I will start those four or five pallets of books going to you. Otherwise we are running close to the wire on that shipment. She asks about the operation I have postponed consistently for two years now. I've got an appointment for September. I expect they will do X-rays and shake their heads and mutter, and book me in for an operation early in 2012. I want to get mobile again, then hobble up the steps of a plane and fly to Key West for six months and write. I am waiting for Albert's timetable. She replies: "I hope you are making progress on Himmler. It seems to take you a very long time to write each chapter." Never satisfied, but I reply at 5:05 p.m: "Yes that worries me too. I am glad you said it however, I shall now work fourteen hours a day, and daydream less. At the beginning I wrote one book a year. Because sources then were nonexistent. Now (a) we have speeded everything up with c.o.m.p.u.t.e.r.s and (b) there is so much more I have to research in. Himmler is a huge subject. It took me almost the whole Madrid period to transcribe the Marga [Himmler] letters, and they will eventually fill perhaps four pages of book. I work twelve hours a day on the manuscript. I snooze only when the cat allows me. But I am very pleased with the writing quality so far." I sit on their plastic white sunlounge to get some sun until R. comes out to chat. All four legs and the seat itself snap simultaneously, lowering my deeply offended person by a foot to floor level with a loud crack and little other ceremony. Total mystery to me. POLAND is suspiciously quiet at present, same as it was at this time last year. Jaenelle reports from Indianapolis: "I'm also heading out soon. Have had a very bad headache all day. . . Figures that I have no Excedrins left in my purse." I mock: "Oh Gosh, your body's suffering from an Excedrin deficiency. That must be the worst. . ."
I finally got Wikipedia to admit that Gerry Gable was a communist by discovering the Australian Jewish newspaper in which he admitted both that he "considered himself (!) Jewish," was on the board ("but not a member") of '62, etc. And, they had to put in the link to that article. (http://www.aijac.org.au/review/1999/242/gable.html/) I was astonished that they went that far, for the article was a poster model of self-indulgent narcissism. Boy, these guys don't leave a blade of grass. It is a pity that large areas of Wikipedia, originally meant to be a free for all, have come increasingly under the iron-fisted grasp of Jewish gangs of controllers, bent on preserving the tilt of history in their own direction and masking their agents and misdemeanours. It is not exactly Masada -- but something of a last stand all the same. I WONDER if I will ever see any money from Arndt Verlag [my German publishers, delinquent in payments for over ten years], or whether my lawyer will come to me with a colossal bill at the end of it. Arndt clearly have no defence, yet are paying only driblets. 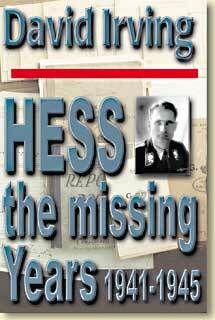 K. has written: "I think you owe it to Rudolf Hess to add a postscript and some photos of what has been done to his grave when next the book is re-printed." I reply to a glowing customer-satisfaction message: "Sorry you had a problem. . . I am impressed by Michael Beschloss, or at least I was by the one book of his which I read, on Kennedy and Roosevelt - and I have liked Joseph P Kennedy ever since reading that book! Beschloss seems a reliable historian." I am on my own today and tomorrow, as R. and Herbie and the boy's father went off to visit her parents on the far side of Budapest, a two-hour drive. But she has stacked meals in the kitchen for me to eat. I dare not decline. TO Jaenelle: "Been writing Himmler since seven-forty a.m. today. I am mortified by your reproaches of 'slowness'. I should have told you, writing a book takes longer than a term paper. Not something one can do in one feverish night fortified by cans of Mountain Dew. I am down to my last four days of coffee here, I fear. A matter of indifference to you, I know. R. is at the airport on standby from four p.m. today. 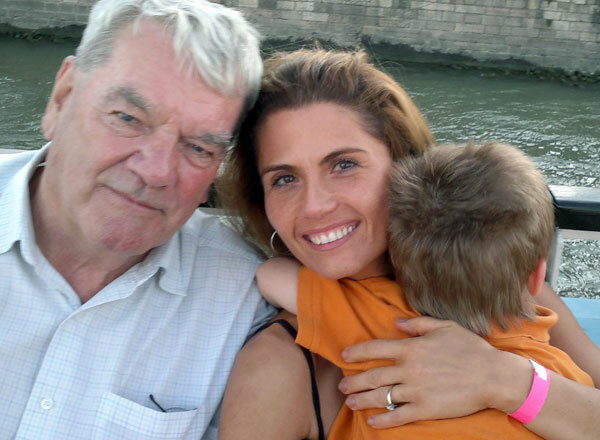 Herbie is at Lake Balaton with his father, who is not in her goodbooks for some reason." Höffkes says he cannot find the originals of all the Goebbels photos in my book, but on Monday he will mail a DVD to me with all the ones he can find, and to which address? I say: "Preferably to us at the Warsaw Marriott," and give him the street address. J tells me she accidentally connected to the local library's wi-fi by mistake, instead of to her own phone. "I only realised it because just now I tried to access your website and it was blocked for being a 'hate site'. Several other sites . . . are blocked for the same reason. "The irony is," she adds, "that the main entrance of the library has a big display up about how they are for free speech and totally opposed to any kind of censorship. Uh. . . apparently not!" -- That's Hoosier-land for you. I suggest: "Write to the Library and ask what censoring software they have installed, as they have blocked harmless websites you regularly visit and are they aware of this infringement of your rights?" "Experts Pick the Greatest Interviews". "Theatre director Kenneth Tynan & right-wing historian, David Irving, were peddling the theory that Winston Churchill was responsible for the death of former Polish Prime Minister, General Sikorski, during WW2. Frost got them in and, using forensic, logical interviewing techniques, completely destroyed their platform". My memoirs will provide a rather different spin on that nasty episode, based on my diaries of the day. [Download one chapter here]. 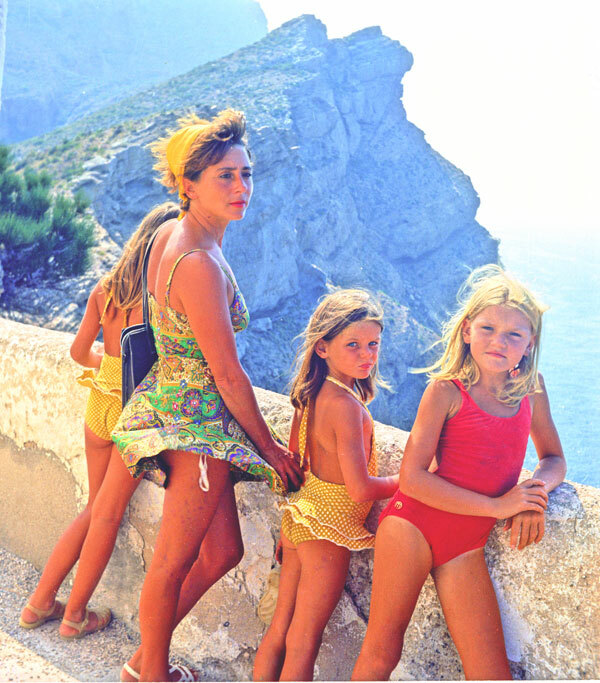 Gosh, over forty years ago. Somebody writes me about a gentleman's biography, which mentions his "February 5, 1938 Dachau 'suicide'." -- I point out: "There were three suicides in my prison block in Vienna during the time I was there. They do happen, and without quotation marks!" The Lancet medical journal states that the rate of UK prison suicides today is between four and thirty times the national average suicide rate. AT NINE p.m. I hobble over for a long and pleasant dinner at a nearby street restaurant with R. -- Spaghetti. She pours out her woes about Georgie. He does not even look for a proper job. I quote Ernie Marples: "Get on Your Bike." He is very friendly and helpful around the house, but R. says his father was the same, a drifter. A lot of pilots etc., hit on her and some have been very patient, for fifteen years or more, but she does not 'love' any of them. I remind her that . . . in the next few years her phone will stop ringing. I am very reluctant to intervene with advice. 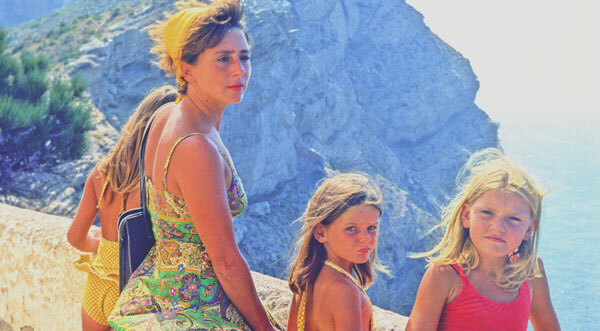 I relate the story of V. -- how I told her to grab the man she had got, though she did not really love him then, as that would follow, and it did. He was way above her in class and education. They are still happily married now, fifteen years later. -- I suggest an ultimatum: Get on your bike, find a real job in the next two months, or you're out. Or was that Norman Tebbitt? SOMEBODY sends me the review he has written for Amazon of Deborah Lipstadt's book. Not always friendly, but I have posted it on the website. Don Bustion has died in Waldo, on August 14. That is sad. Very friendly and inquisitive. A Washington DC lawyer. I called the number on his card a year later, and the firm never existed. We were always rather suspicious of him and whom he was really working for. R. WAS away to Cyprus during the night, and returns around seven a.m.; she flies off tomorrow morning again at five a.m. Sounds like an airline with a rather brutal atitude toward their staff. A Chinese airline wanted to take Malev over, but turned and fled. They have mothballed all their jumbos in hangars here at Ferihegy, and operate only short-haul flights. I still wear the shirts she brought me in prison from Shanghai and Tokyo, though Asians have smaller necks than us: or is that a racist remark? There are wasps here, but they recognise a seasoned enemy and stay a respectful distance. Hungarian food: very fattening. The sooner I get that leg replacement and can resume tennis, running, biking, swimming, and other fitness stuff, the better. You should not be working on a Saturday. That is what men do. I want you arriving in Warsaw fresh and eager. . . I wish the German publishers would admit their debt and pay up. That would make such a difference. . . My lawyer has sent me more court papers during the week, and our action is making progress in two different courts. The other side is stalling for time; they have just been granted a two-week continuance. Possibly hoping I will pass on. If the cat doesn't bite and scratch me to death. No fear of that for ten, twenty years, I hope, D.v. as we scholars say: Latin for touch wood. Otherwise not much point getting the replacement. The same lawyer has voluntarily started proceedings to get the ban on me lifted; I am not optimistic. It is his idea to do it. It is all very arbitrary. Next Himmler chapter is shaping up well, no thanks to females carping at how long it takes me. Everything else, females want to spin out; when it comes to writing books, it is schnell, schnell, schnell! 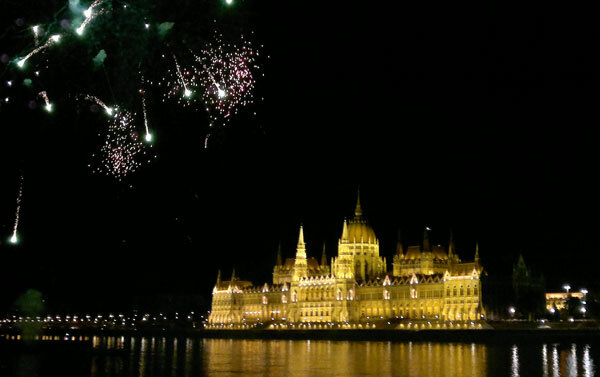 IN the evening, we all drive down to the Danube for the evening's St. Stephen's Day fireworks display. Immense crowds are assembling on both banks of the river between the Chain Bridge and Margaret Bridge. It is like Labour Day on the Ohio at Cincinnati (but without the shouting competition). R.'s father has bought four tickets for us to go onto one of the long, sleek Danube river craft, which holds I guess around 2,000 passengers on three or four decks; our pink wristbands take us to the open top deck, and here we while away three hours from seven to ten p.m. The display will start at nine p.m. All the stately buildings, churches, and the Citadel have been brightly illuminated since dusk except for the old Parliament itself (above) on the other side of the river, which is freshly scrubbed and lapses into darkness with just a few pin-pricks of light occasionally twinkling amongst its spires and balconies where invisible people are taking pictures. Both embankments are glittering with stabs of light from digital cameras, every flash bringing closer the death of Agfa, Eastman-Kodak, and Fuji I suppose. Odd, that they never saw it coming. The boat slips away from its moorings and cruises lazily around the pool in front of the darkened Parliament, slides under the Chain Bridge -- so close that people reach up and think they can touch the girders as we pass beneath. The boat moors again, and we all sit around and chat. There are far too few chairs for the five hundred or so on this top deck; I sit with R. who instinctively gives away the two others to a stranger who asks, so there are none for Georgie or her boy when they return. R. is looking very good, of course, in a thin black dress with thin straps. Even better than when she visited me once a month in that Vienna prison. That certainly made life in solitary more bearable. The evening starts warmly at 32 degrees, and cools down to 24 when we drive back. Georgie takes several photos. Herbie, 4, misbehaves, and when the colossal fireworks display starts -- at nine p.m. on the dot, with a single bright rocket fired into the sky -- he starts screaming and holding his ears, and sits like that on R.'s lap for the next thirty minutes (as I have predicted). There are three or four 500-ton fireworks barges spaced along the river, the ignition programming evidently synchonised electronically. The old light-blue-touchpaper days are gone. The musical accompaniment, thundering from loudspeakers with inch-thick cables along the sidewalks, is well synchronized. After twenty minutes of fireworks and music, interspersed with deceptive five-second pauses, the whole Parliament building is suddenly and brilliantly illuminated with floodlighting from end to end. At the finish, wave upon wave of fireworks flash and flare, the vast balls of sparkling fire tilting more and more toward us until they are right overhead, which is an awesome sight, and very impressively done. I FIND myself wondering what it felt like to be in the winter streets of Dresden, Pforzheim, or Würzburg in 1945 as the first Illuminator flares and Pathfinder "Christmas trees" suddenly appeared high in the sky overhead just like this, ominous heralds of the arrival of RAF Bomber Command. Nearly two hundred thousand burned alive, in just those three towns. Just as R. can never stop being a mother now, I can't stop being an historian. Ten thousand people try to get into the Underground station after that, and we give up and have a small supper instead. R. is very affectionate throughout, I assume she does it to make a point to Herbie's father. He is very decent about it all, but does not get whatever point she is making. She has a four a.m. call tomorrow, and has to be at Ferihegy at five a.m. for a flight to Beirut. These flights are always full.